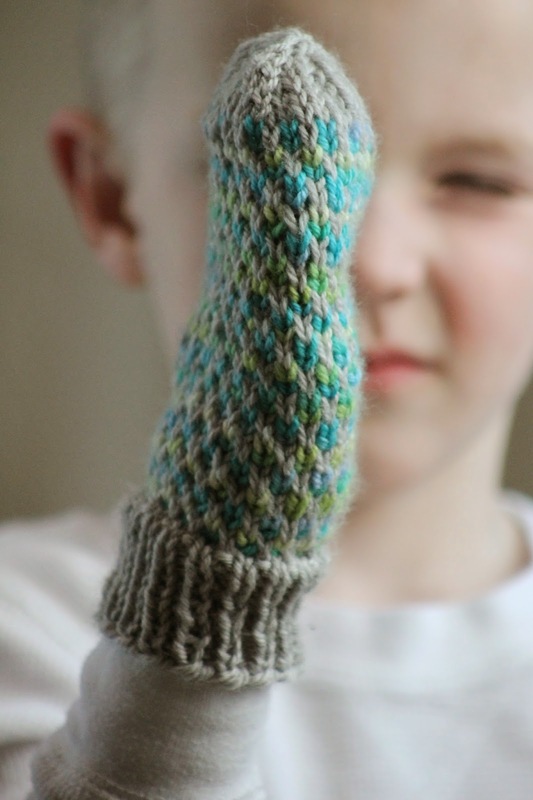 Using tapestry needle, thread through final stitches, pull tight, thread to inside of mitten and knot. Clip yarn tail and, using your tapestry needle, thread through remaining stitches. Pull tight, thread to inside of them, and knot. Tuck in ends. Finally, as with all slipped stitch patterns, you may need to do some stitch-scootching at this point to achieve perfection. My three-year-old in the toddler size. 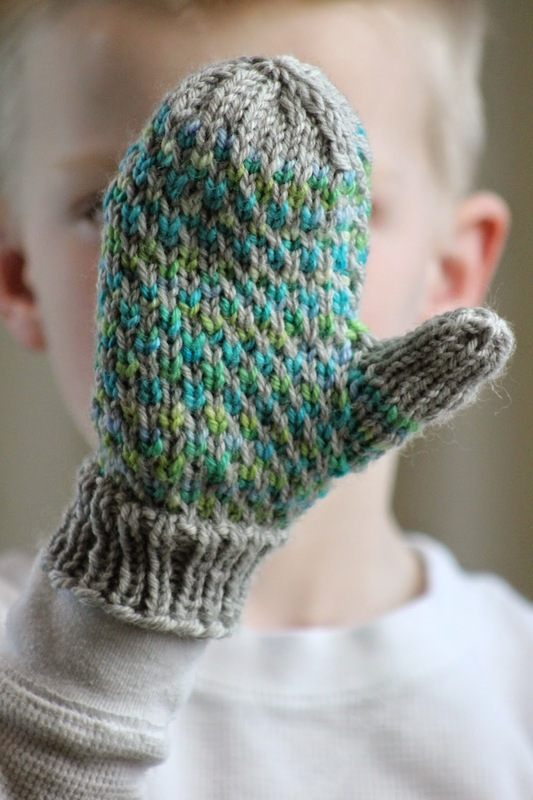 How cool- I just found your post by searching for a mitten pattern on ravelry today- the same day you posted! 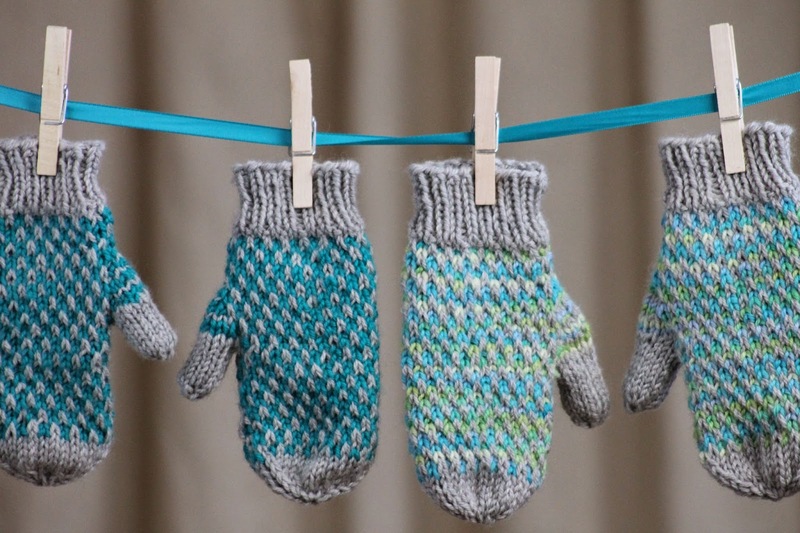 Just wondering, do you know the palm circumference of each mitten size? I'm making mittens for my dad - 9" palm circumference. We live 8hrs apart, so unfortunately I can't have him try them on as I'm knitting. I was going to cast on for Adult Large, but I'm wondering if I'd need to cast on a few extra stitches. It sounds like I picked the right day to post this pattern. :) And the adult large should turn out around 9.5" in palm circumference, which sounds like it would work. If you're concerned that the slipped stitch pattern might narrow your gauge a bit, though, it's very easy to modify this pattern - simply cast on any multiple of 2, and then follow the directions for adult large for the thumb gusset. Adding another for stitches, for instance, would add almost another inch to the palm circumference (and adding another 2 would get you close to 10" around). Please let me know if you have any more questions! These are beautiful!! Thank you for sharing!! I love patterns created by people with young children. They are usually the easiest to understand and best use of time. Thank you again!!! I can't wait to make these for my niece's twins! Thanks a bunch for this pattern! I just made two pairs for my little girls. They will be perfect for the cold and snow that will soon be coming! 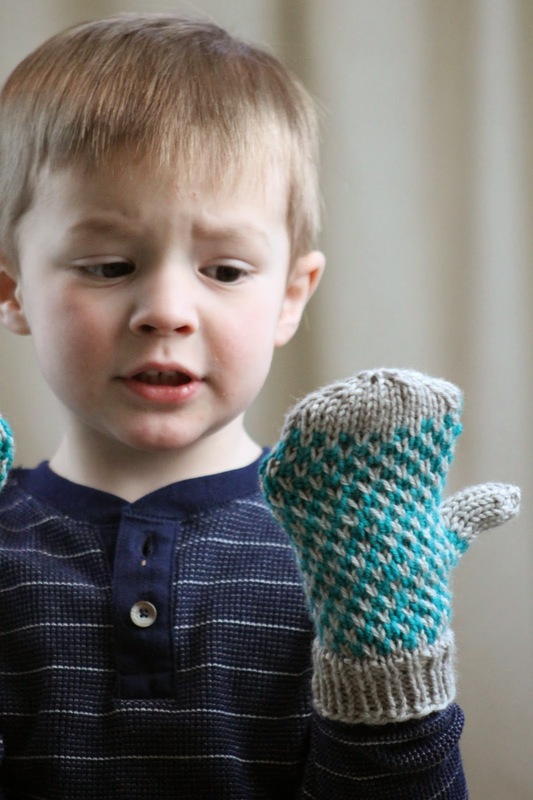 And I love that you have written the pattern to included so many sizes! Thank you again and again for this beautiful free knitting pattern!! I'm so glad that you enjoyed the pattern! My boys are still wearing theirs too. :) And please, let me know if you ever have any questions. I am always happy to help! 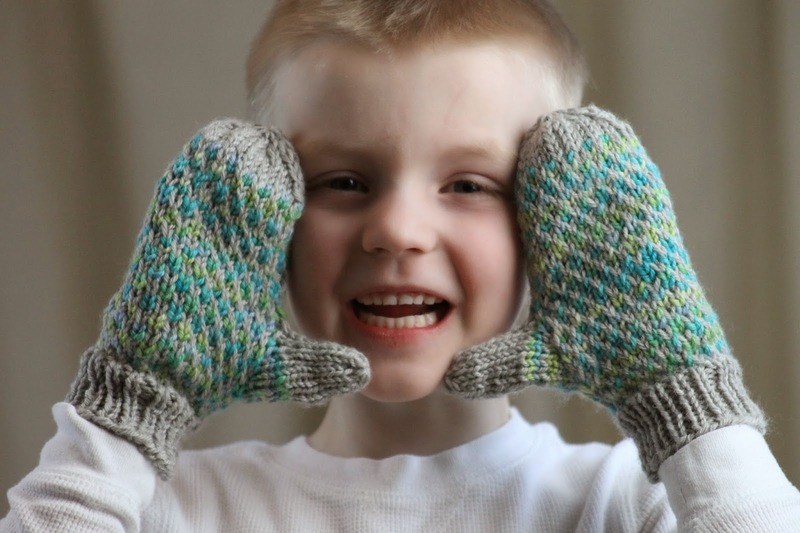 I love the look of the mittens and would like to make a few for my grandkids. Thanks for posting. I would like to know when you slip the stitch, do you slip knitwise or purlwise or does it make a difference? I'm glad to hear you like the pattern. :) And you should slip purlwise; slipping knitwise twists the stitch, which would give a different appearance. Let me know if you have any other questions! 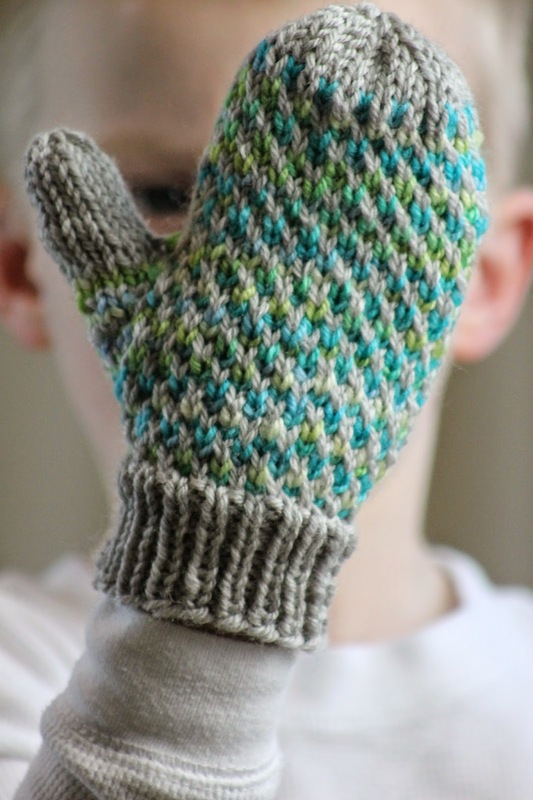 Lovely pattern, I think I'll try it for my 2.5-year-old. What do you mean by stitch-scooching? Is there any way you could tell me in grams or ounces how much yarn the toddler size takes? I have some yarn leftovers and want to see if I have enough. Thanks! Looking to make these for my 3 year old son, but not sure if I should do the child small or medium (he's a big boy). Any estimate on the palm width for these two sizes? I am a beginner in knitting & this is the first time i have taken mittens to knit. can you please explain me in detail about this "Set-up Gusset Row 6: using color A, k1, m1r, slip marker, knit across remainder of stitches in row, place marker, m1l". In this i am confused on which needle i have to "make 1 left". Thank you so much for helping me the mittens came perfect after that. I knit them for my daughter & she is so happy that she decided to wear them whole day. Thanks for the great pattern. I've knitted one so far and it turned out well. Would you happen to have a pattern for a matching hat? I'd love to make a set. I'm not a very skilled knitter so I need to follow a pattern. Thanks. I'm glad to hear you're enjoying the pattern! And I don't have a hat pattern to match, but I can certainly help you with one in the comments here. What size are you looking to make? I would like to make a matching pattern hat in child medium. Hi again! I'm posting the pattern below. You'll notice that I've only given a child small and child large size - that's because hat sizing isn't as finicky as mitten sizing. If you'd like some help choosing a size, let me know! Knit rows 1 – 6 until hat measures roughly 4.5” (5”; 6”; 7”) and you’ve just finished row 3 or row 6 of the pattern. Clip your color B yarn tail, since you’re done with it. Then work the decrease, as follows. Remember to switch to your dpns once you’re getting ready to drop below 80 stitches. No worries, I'm not timing you! :) And let me know if you have any questions!!! I just happened across this pattern while surfing on AllFreeKnitting.com, and I love it! I love slip stitch patterns because they are so easy and look so complicated when they're finished. I can't wait to make these for my grand-nephews for Christmas. Mittens are so quick and useful. Does anyone that has made them have suggestions for color combinations? 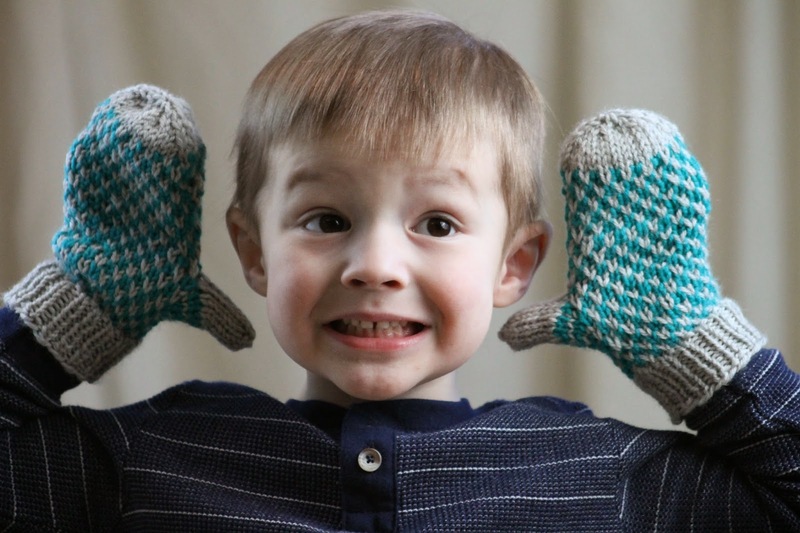 I wanted to thank you for the mitten and hat patterns. I've made both in pretty girlie colors but the slipped stitch part of both projects seem a bit tight. This is my first color work project so I don't know what I'm doing wrong. Normally my gauge is on the loose side. Help! Long story short, slipped stitch patterns always end up a bit on the tighter side, and the biggest thing you can do to help that is leave your yarn loose behind your slipped stitches - I usually recommend leaving it as loose as you possibly can, looser than you even think might be right, because I've personally never been able to make it SOOO loose that it becomes a problem, although I'm sure there's someone out there who can. :) It's definitely just one of those techniques that requires practice!!! I love this pattern! Could you help me turn this into a scarf? And what kind of selvedges would you recommend to hide the yarn changes? Yes, this would make a great scarf! And I would definitely recommend a faux i-cord edging for a slip stitch pattern like this one - you'll be able to hide your weirdness beautifully, and you won't even see your color changes. The only issue with this pattern is that you will have to work with 2 balls of your color B yarn, since you’ll begin with color B on the right side on row 1, end with it at the end of the wrong side after row 2, and then pick up with it at the end of the right side after row 3 (am I making any sense here? You’ll quickly see why you need two balls if I’m not). However, even though you’re using two balls and have more rows between the color changes, the faux i-cord edging will allow you to carry your yarn rather than tucking in ends – just make sure you wrap your color A and color B every time you change colors and you should be good to go! So, here's what I would do (and of course you can change your edging if you'd prefer). Oh, and remember that you’ll want to keep your slipped stitches loose behind the main pattern, but that you can tug them tighter for the 3 slipped stitches at either edge. Knit edging rows 1 & 2 twice, and bind off loosely in pattern! Thank you so much Gretchen! However, I am using circular needles - so why would I need to balls of yarn? Could I not just slide across and knit from whatever side the yarn I need is at? But, it all looks beautiful! Ah, that's totally my problem! I either don't finish or don't make the season!!! Such is life. :) Anyway, glad to hear it all looks good, at the very least!!! Gusset row 1 "knit until first marker" is that only 2 stitches?and then 1 knit at the end? Gusset row 2 again is only knitting one at the beginning? Gusset row 3 is making one at beginnng and one just after the marker? With jus a stitch to the end?? 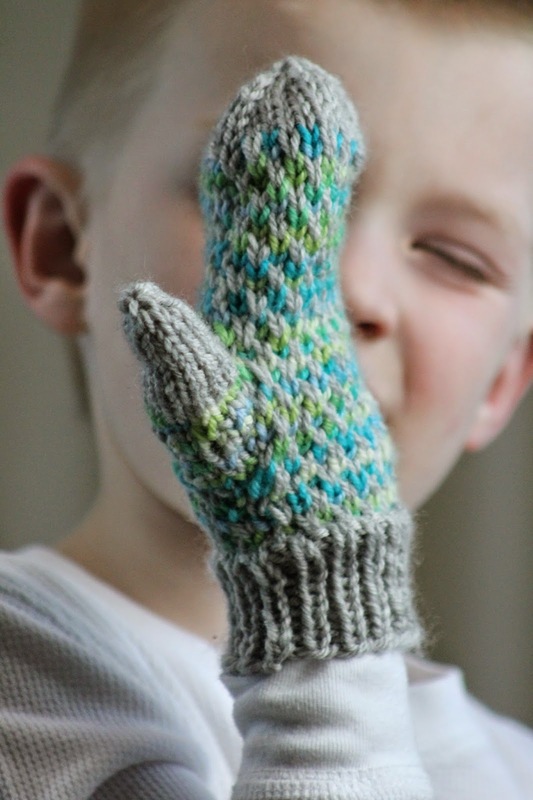 I love this mitten pattern! It's so easy, yet looks so complicated. One question tho: when you're finishing the two color pattern, just before you clip the tail of your color B yarn, when you say, "...and you've just finished row 1 or row 4 of the pattern. ", shouldn't it say row 2 or row 5? Otherwise color B is a different size. Next I'm going to try the matching hat! Thanks for sharing!! Just have to say a huge thank you for all your fabulous patterns. As well as being hugely creative, I suspect you are one of the most generous designers out there. It really is appreciated. Thanks for your kind words. :) It's certainly my goal to be accessible and helpful with my patterns, so I'm glad it's appreciated! In general (and definitely on my site), stitches are slipped purlwise unless otherwise stated, since slipping them knitwise twists them. Also, the once twice etc business is just giving instructions for the different sizes; directions for the size you're making will always come in the same place, as listed in the sizes above. Ahhh, thanks so much! I get it now! I think I am addicted to your pattern. They are so much fun to make...and you seem so helpful. Thanks for sharing. 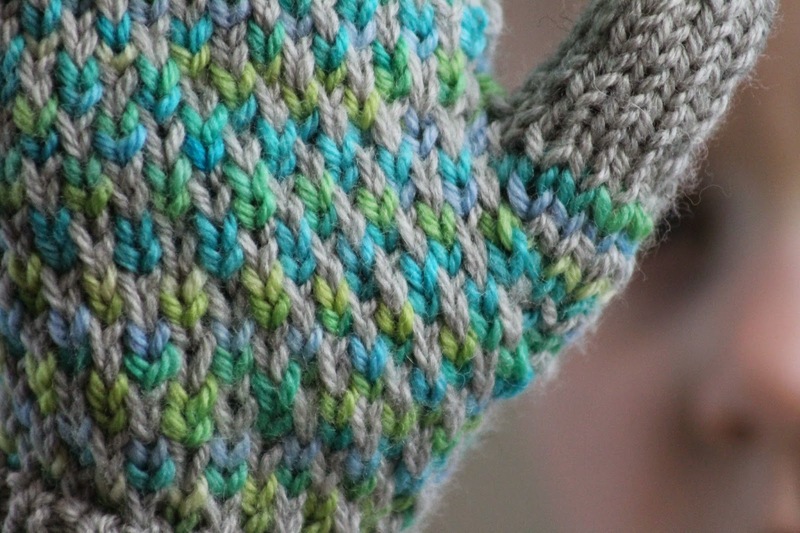 My only problem is the jogless seam...When I look up the side of my mitten...they seem a little off kilter. Not too noticeable...but you know how we knitters are...we can see every mistake. Thanks for sharing your beautiful pattern. I desperately need help with the gussets. I'm on my fourth try and its just not working. I love the pattern and don't want to frog my 1/4 finished mittens. Thanks. Is the marker replacement row knit in color B ? Gorgeous pattern. Thank you. Hi! Glad you like it! :) And no, you're done with color B now - the decrease is all worked in color A. Awesome mittens. 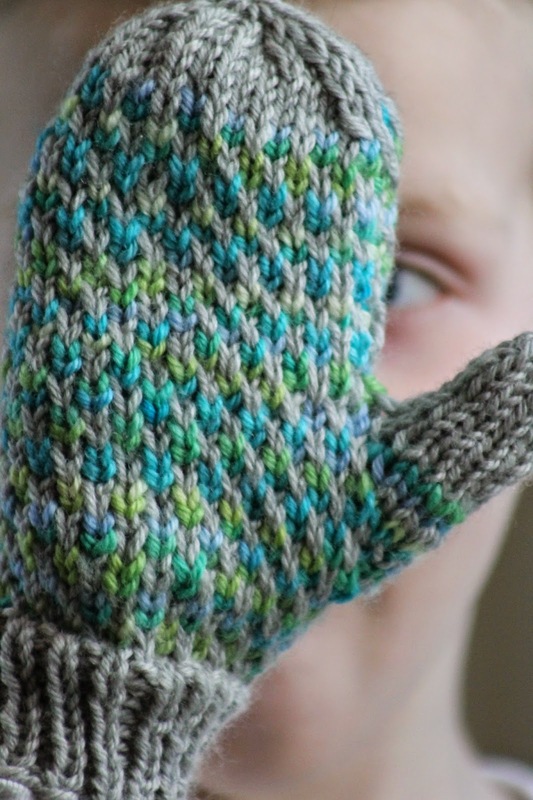 Will try this pattern for fingerless gloves.